Heading into the holiday season may be the best time of all to consider upgrading or installing a new security camera system for your home or business. Prices will be reduced for the holidays, and you’ll be able to get better security technology than you did just a few years ago. Expect to pay around $400 for a basic system of 4 cameras and a recording system, up to $5250 or more for 16 cameras with low light detection, motion sensitivity, color, and indoor plus outdoor capability. Before we confuse you, read these major points while considering a new security system. Are you using wired or wireless locations? or both? The size of the capture device (the DVR). How much video do you want to store? How many cameras do you need to feel secure? Is your system going to be indoor only, outdoor only, or both? It doesn’t get more complicated than that, although if you do enough reading about surveillance systems, you’ll certainly find enough information to be confusing. Recognize a security camera system is only a deterrent, not a guarantee that you won’t have a robbery in your home or business. The only thing the cameras do is capture the event. Catching the bad guy is up to you or the police. It is NOT altogether necessary to hire a monitoring company to watch your home or business. Upwards of 95% of all alarms generated turn about to be false alarms. Many agencies charge the homeowner, or security operator for these false alarms if they have to send a unit to investigate. What you are doing with your security camera system, is providing a deterrent for the would be a bad guy. You are making your property a little less attractive than perhaps your neighbors or someone down the road. We’ll work on a home project for this article. Start your project by mapping the potential areas of the breech that might occur. Doors and windows are clearly the main places, but there may be particular doors or windows that you can identify as a high risk. Windows that are not facing a street, for example, have a high level of intrusion possibility. Same for doors. Once you’ve decided where the break in can occur, look for mounting locations for your security system. It’s here you will want to answer the question of wired or wireless. All cameras ARE wired in some form or fashion. They all need to have power to operate, so do look for locations where power is available. Wired systems in this case mean a camera that delivers its signal back to the recording device by use of a hard wire connection, versus the wireless broadcast of camera video. There are cameras that operate on battery only, but these are not cost effective for our project. A good way to save yourself money is to use a single device to cover multiple potential attack points. One camera can cover multiple rooms, simply by being placed in the right location. Your map of potential targets will help you locate the places you can save money. Note the lighting in the areas that will be monitored. Make a camera selection based on these criteria; a) the lowest amount of light that might be available in the area; b) wired or wireless camera location; c) motion detection on the part of the camera; d) closed circuit (CCTV) or digital (on board recording). The rest of your decision will be about the way the device looks, not about the function. Select the camera type and number you need to complete the job and you are half way home. One other money saving tip. It’s NOT the camera that’s the expensive portion–it’s the camera lens. A cheaper camera, with an upgraded lens, can provide you with the best quality picture for a significantly lower price. I’ve used this tactic in multiple homes where I’ve installed these systems. The capture device, which looks a lot like a TIVO unit or a home DVR system, really doesn’t require a lot of work. How much do you want to store versus how much do you want to pay? Remember again, you are not running a Dateline NBC sting operation here, the recording device is UNLIKELY to ever be used to prove anything. Don’t focus your energy here. 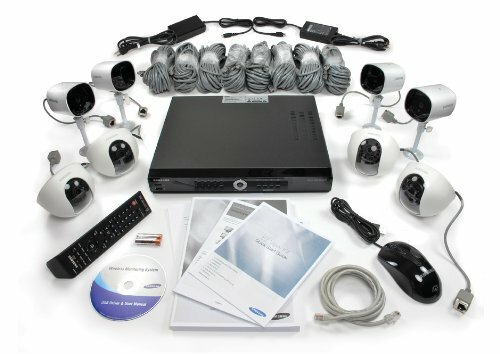 Your best bet are the “surveillance systems in a box.” The package an entire security camera system in a single box, including the wiring (if any is needed) recording device, cameras, and instructions. It doesn’t get much easier. Your decision will be made based on cost, and how many cameras do you need. Finally, it’s worth repeating that no security camera system can prevent burglary or break in. They are only designed to make your property less inviting. There are even security camera systems which use FAKE cameras and devices as a deterrent. Those I don’t recommend as most bad guys can spot a fake a mile away. No matter if you do it yourself or hire your security project done by someone else, you now have the costs, the key points to know, and the best questions to ask. Just acquired the Arlo Smart Home Security Camera System .Would definitely recommend to anyone looking to acquire a security camera system! I am looking to acquire a new set of home security system/security camera system this Xmas holiday. with the information I have gathered thus far from your site, it would be a walk in the park. Perfect timing! We are planning a trip, my family and I and will be gone for 2 weeks starting on next Friday. My husband said he needed to get a system installed but wanted to know just what to look for. This post has been very helpful! We will have someone stopping by to feed the dogs and such but we want to make sure everything is secured and safe before we go. Thanks again for this informational guide. Someone recommended that I get a DVR system so that I have everything that I need in one straight order. I think I will have someone set it up for me. I know that these systems are a lot easier these days but even some of the DIY aspects confuse the crap out of me haha! I really found this article helpful though, thank you. I wish I had actually gotten some cameras put in over the last Christmas. When my family and I went out for our usual dinner on Christmas Eve, someone broke in. They got all the gifts as well as the TV and small appliances. Thankfully we had insurance to cover it but it was such a hassle. We are just now getting are money back from the robbery. Have wireless cameras would have ensured they got caught too. My family goes out of town for 2 weeks 2 times a year. Once for Christmas and once for Easter. We go to my parent’s home and then to my wife’s and alternate. This past Easter we had a break in happen and had to cut our time short. We thankfully were covered but it still sucked. We are now looking in to security camera options. Great read! I will take your advice. I just got out of a painful contract with a security company. I won’t name names here but it was awful. They basically ripped me off and did just what you said in your article here. I am now looking into getting my own system and I feel better about the choice already. My wife will have to come around to it but she is confused thinking we need to spend a fortune on it and we don’t! I was i the same position as Oliver. I was locked into a contract with a security company and they were over charging me a lot. It is nice to know we have options here. I am planning on ordering a system tomorrow when I get paid. I have a few picked out on Amazon already waiting in my cart. I just have to research them a bit more and make my choice. Great article! This was great! I am actually going to stay outside the country to help my wife’s family with her and we will be gone nearly 6 weeks. We don’t have anyone to rely on for house watching so I have been trying to find the best option for us. I think using security cameras we can access through wifi will be perfect!